Furthermore, this impatient, greedy attitude is responsible more than anything else for the excessive stupidity we find in the world. Just as such people have no patience to chew up real food, so they do not take sufficient time to “chew up” mental food. As modern times promote hasty eating to a large extent, it is not surprising to learn that a great astronomer said: “Two things are infinite, as far as we know – the universe and human stupidity.” To-day we know that this statement is not quite correct. Einstein has proved that the universe is limited. An observation of Leverrier gave Einstein the basis for exploding the phantasy of the ether. 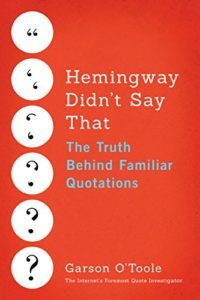 A separate QI article tracing the Dumas attributed statement is available here. In conclusion, this quotation has evolved over time in the books of Frederick S. Perls. A sub-phrase was deleted and a sub-phrase was added. Also, the initial attribution in 1947 is not very clear. The accuracy of the saying apparently depends on the mutable memory of Perls. Update History: On January 5, 2019 the 1865 citation was added together with a link to the separate QI article on the topic. In addition, the bibliographic notes were changed to a numeric style. Great article, Ken! Thank you for locating it and sharing it with fellow readers of this blog. Kuddos: The link above should answer your inquiry. Nice job, I was just doing my own research on this on google books for Einstein’s wikiquote page, came across two of the quotes from Perls and then found this article which is very helpful. I also discovered that a very similar quote was attributed to the French philosopher Ernest Renan at earlier dates…this book from 1915 says “He quotes the saying of Renan: it isn’t the stars that give him an idea of infinity; it is man’s stupidity.” Various books claim the original French version is “La bêtise humaine est la seule chose qui donne une idée de l’infini” (which doesn’t mention the stars), though this one from 1904 and this one from 1903 give it as “Ce n’est pas l’immensité de la vôute étoilée qui peut donner le plus complétement l’ideé de l’infini, mais bien la bêtise humaine!” which translates roughly to “it is not the starry sky that can give the most complete idea of the infinite, but human stupidity!” But none of the sources that attribute it to Renan say where it can be found in his writings, so I would guess this is just an earlier false attribution! Even earlier then these I found the book “Des vers” by Guy de Maupassant, which says on p. 9 that it’s from 1880, which also has a quote from a letter by Gustav Flaubert on p. 21, “Cependant, qui sait? La terre a des limites, mais la bêtise humaine est infinie!” which translates to “But who knows? The earth has its boundaries, but human stupidity is infinite!” It may just be an old cliché rather than something Flaubert invented, this page which is also dated 1880 but is from a different author says something similar (“Aujourd’hui je sais qu’il n’y a pas de limites à la bêtise humaine, qu’elle est infinie” or “today I know that there is no limit to human stupidity, it is infinite”). Jesse M.:Thank you very much for visiting the blog and sharing those valuable citations. I agree with the Investigator: the “Two Things Are Infinite” quote is probably NOT coming from Einstein. Next Next post: How Do You Get To Carnegie Hall? Practice!